For March, we will be making traditional Shoo Fly blocks from floral fabrics with white-on-white (WOW) backgrounds. Kate made this beautiful example. The directions for making the blocks can be found here (on quilting.about.com). 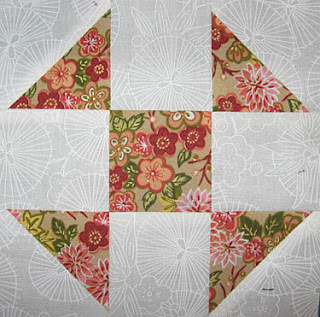 Also check out Kate’s step-by-step directions on this blog for sewing half-square triangles. The March block lotto discussion on the forum begins here. You may make up to 8 blocks to enter in the block lotto. The floral fabric used in each block must be unique, however you may use the same WOW background fabric in all your blocks. Several of the sneek peekers have already made their Shoo Fly blocks–you can see them here: March Photos. Thanks again to those who have taken part in the first two month of the block lotto – we’ve seen some great blocks, and we look forward to seeing many more before the end of the year.